The price of crude oil future are ending the week down. The price today is settling down -$0.29 or -0.63% at $45.59. The high for the day reached $46.77. 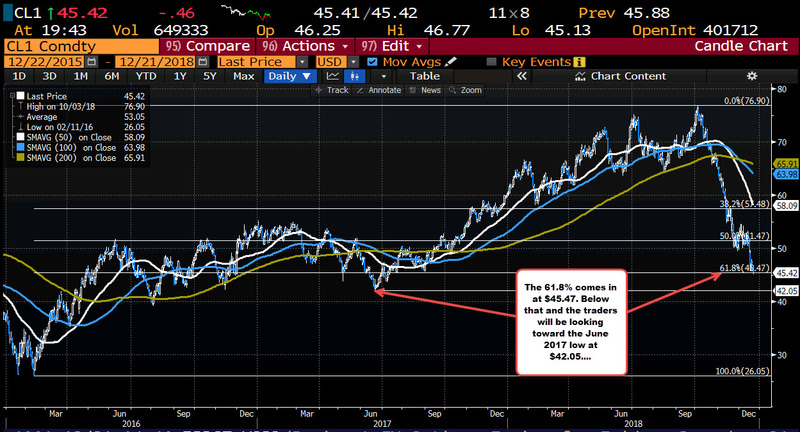 The low extended to $45.13. Last week the price closed on Friday at $51.20. The low today extended to $45.13. The % loss for the week -10.9%. The fall this week was mostly in response to the expectations for weaker global growth. Technically, the pair is settling right around the 61.8% of the move up from the 2016 low. That comes in at $45.47. The price did dip below earlier in the day. Next week, a move below $45.47 - with more momentum - will look toward the $42.05 area.